November 11 is the day we honor all who served for our country, this day is called Veterans Day. Every year the Department of Veterans Affairs and the Veterans Day National Committee publishes a tribute poster for Veterans Day. This year the theme is “Courage- Honoring All Who Served.” They pick the theme each year through a national Veterans Day poster contest. If you are unsure how you can be courageous this Veterans day, we have some great ideas for you! Everyone has fears, whether you’re scared of spiders or are afraid of heights, at some point you have to face them and that is courage. That being one definition of courage, there is another definition as well, and that is showing strength in the face of pain or grief. Our veterans have faced their fears and also have shown their strength when they are faced with unimaginable pain and grief. So now is our time to be courageous and help them. Maybe you have been wanting to volunteer for a while, but are scared to give up the time you have to relax. This Veterans Day be courageous and give some of your spare time to help veterans in need. There are many great organizations looking for volunteer such as Fischer House Foundation, Wounded Warrior Project, United We Serve and many more. Some people have a hard time talking to others; if this is you, show your courage by walking up to a veteran you may know or see and talk to them. They might just tell you some interesting and fascinating stories of what it was like serving our country. You will not regret this experience. 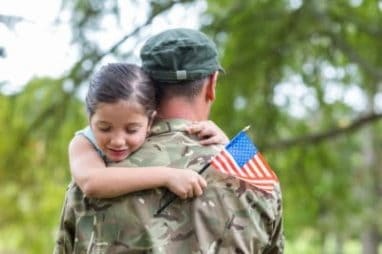 Trying to teach our kids the meaning of Veterans Day can be hard, and if they’re afraid of loud noises and guns it might be hard to take them to a memorial event. Show them this Veterans Day how to be courageous and support our veterans at a parade where they will see veterans holding guns and or shooting off fake rounds into the air which might come with loud noises. If you can’t make it to an event but still want to support our veterans, a great way is to show your support is by learning the history of Veterans Day. President Woodrow Wilson proclaimed November 11 to be Armistice Day in 1919. November 11 is an important day because it is when hostilities ceased on November 11 at 11 a.m. putting an end to World War I. Then on May 13, 1938 Armistice Day was declared a legal holiday each year. However this day was dedicated to world peace and not to just honor veterans. However, on November 11, 1947 Raymond Weeks, who was a World War II veteran, organized a National Veterans Day parade in Birmingham, Alabama in recognition of veterans from all wars. This celebration made Congress change Armistice Day to Veterans Day in 1954 to recognize veterans of all U.S. wars. Many people don’t get Veterans Day off. If you are one of these people but would still like to help people in your community, we have a great way you can help. If you have an unused vehicle of any kind you can donate it to Wheels For Wishes. By donating your vehicle it saves you the hassle of trying to sell it. All you have to do is fill out our online donation form or call us at 1-877-431-9474. It is as easy as that! We are a 501(c)(3) charity program so your vehicle is fully tax deductible. What are you waiting for? Show your community you care, by donating your vehicle today!